You wanted to say something. Do something. Help in some way. But you just weren’t sure what to do. So you said nothing. Did nothing. Helped no one. People experiencing grief need understanding and compassion no matter the reason for their grief. Whether the loss of a loved one, loss of a pet, divorce, or the list could go on, grief is experienced in various stages and phases. There is no right or wrong way; grief is a processing of losing someone or something you love mixed with the reality that things will never be the same again. How can you help a friend through this valley? 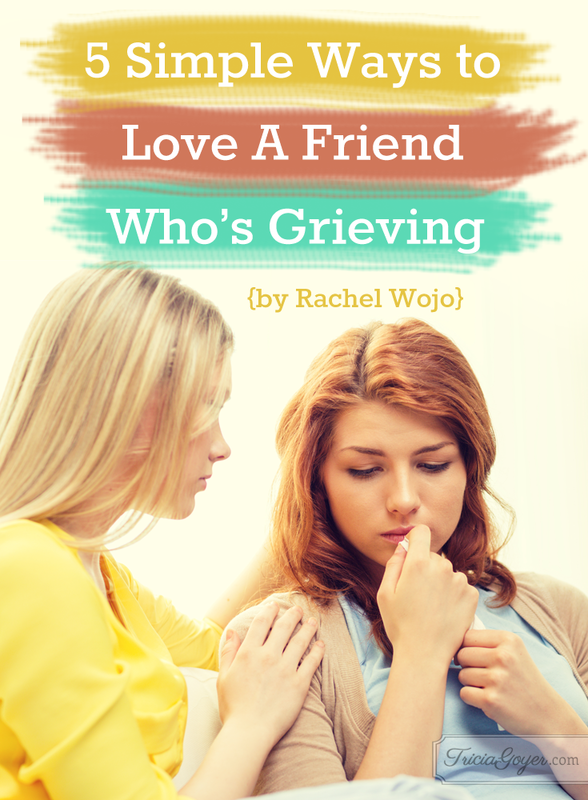 Today I wanted to share 5 simple ways to love a friend who’s grieving. Be watching for ways you can help or suggest to others to help. A grieving person may not even know what they need. Look for a meal plan in place. Watch for things that you know need to be accomplished—like grass that needs mowed, a car that needs washed, or a bathroom that needs cleaned. A few years ago, I was working on a church Helping Hands team and each week, I cleaned an elderly lady’s bathroom. Every week she told me it was the nicest thing anyone had done for her since her husband’s death. Her pain was eased tremendously all because one person gave with their eyes and saw her need. 2. Love with your heart. Filter your conversation to allow everything to flow with love. Years ago, I was honest about something with a grieving friend. She didn’t need my honesty in that moment; only I didn’t know any better. I don’t feel that our friendship ever fully recovered, though I really had the best intentions with what I had to say. Love a grieving friend with a bigger love than you’ve ever shown before. Be the one willing to give more grace. Use your words sparingly and make sure they are saturated in love. The first time they may say no. But don’t let that hinder you from setting a reminder on your phone to ask again a few days later or in one week. “Is there anything at all I can do for you?” “Could you use a gift card to bring dinner home one night after work?” “Could I stop by and clean your bathroom on Saturday?” The simple act of making the griever aware of your willingness is a wonderful way to help and love them, whether they choose to accept your offers or not. Errands do not stop for grief. There is still trash to be disposed of, mail to pick up, groceries to shop for, and meals to cook. Helping a friend through grief is an opportunity to be their feet—the doing mechanism for all things routine. Listening is an enormous gift to give to a grieving soul. I believe it is such a gift that I’ve deemed it “the permission to ache freely.” Permission to ache freely is simply allowing someone to grieve by giving them as much time as they need. A huge part of that is stating that you understand and giving them space to breathe, never rushing the process. Isn’t this what Christ does for us as Christians? He loves us so much that he died for us, but even after we’ve accepted him as our Savior, he tells us to come. He calls us to bring our burdens to him and leave them there. He gives us the opportunity to choose his will, yet always gently shows us the way. Maybe your friend could use a tool to help her navigate the emotions of grief or hurt. She needs to find a source of strength and discover the assurance that she has the ability to keep going, even when everything just keeps going wrong. Maybe this post wasn’t meant to share with a friend. Maybe this post was meant for you. 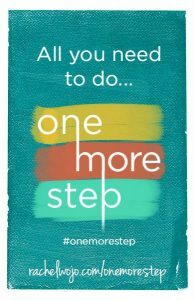 Enjoy the first chapter of my new book, One More Step, for FREE or download the FREE Stepping Stones resource as a tool to discover how to find strength when you feel like giving up. How do you feel about the “permission to ache freely? Rachel “Wojo” Wojnarowski is wife to Matt and mom to seven wonderful kids. Her greatest passion is inspiring others to welcome Jesus into their lives and enjoy the abundant life he offers. As a sought-after blogger and writer, she sees thousands of readers visit her blog daily. 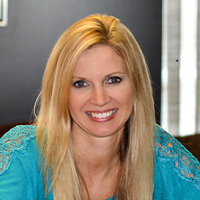 Rachel leads community ladies’ Bible studies in central Ohio and serves as a Bible study teacher, leader, and event speaker.